New England beer-loving sports fans invade NYC…daily! There are Red Sox-loving, Yankee-hating beer bars in every town, large and small throughout New England, but where does the diehard boisterous fanatic from Sox Nation dare tread in the lower heart of Yankee Nation? 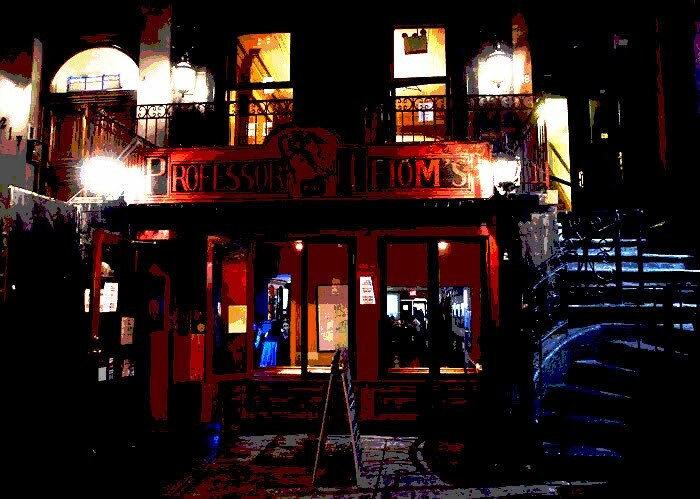 Professor Thom’s 219 2nd Avenue, East Village NY! That’s wheyah! Professor Jerry Thomas, as legend has it, is the "Father of the Cocktail and First Celebrity Bartender in America". Let’s just hope, for the sake of his soul, was a lunatic New England sports fan. Half Beer bar, half Sports bar (with an in-your-face New England slant). Most everyone in the place are loudly routing for the Pats, Sox, Bruins or Celtics and lustily booing the Yankmees, Knicks and Rangers. You would think there would be silent indifference towards the Jets of New Jersey, but that is not the case. No sir! The J-E-T-S! - S-U-C-K! You see, this sports bar is smack dab in the bowels of Lower Manhattan where real New England sports fans gather to mispronounce words with the letter “R” (ah), while enjoying a wonderful variety of fresh beer and good pub grub. The bar and seating area is long and narrow. There are LCD screens all around, including some small ones for individual seating areas, plus a gigantic widescreen hanging on the back wall. 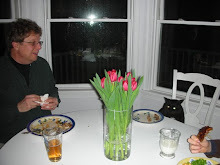 The service is prompt and courteous (a real oddity considering the location). The waitress memorized the beer list (see below), with the exception of not knowing which Bell's beer was on tap at the time. She rushed to the bar for confirmation! Our food (mostly from the appetizer menu) arrived tasty and hot. The Nachos were large enough for four hungry men. The hot wings were very spicy and had a near perfect crunchy, crisp skin and tender and meaty inside. The bar pizza was thin but crusty with a zesty sauce and plenty of well-tanned cheese on top. On a separate visit, we tried the Steak Sandwich and Chicken Quesadilla. Both were huge and delicious! And sad to say, the usual suspects from the Mass Mega-Swill brewers, who shall remain nameless, are taking up valuable tap space. Upstairs is a turn of the century-style loft, featuring a 20’ vaulted ceiling, an oak and mahogany bar transplanted from the famous Mayflower Hotel, and a grand chandelier. It’s a great place to book for a medium-sized party. It is a bit unusual to hear the distinctive accents of so many Red Sox, Celtic, Bruins and Pats fans in attendance in this East Village sweet spot, but once inside its all-so-natural and oh so much fun!